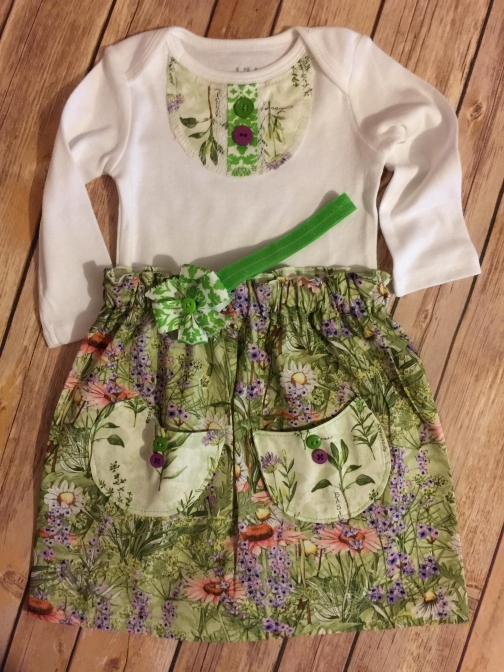 Spring Baby Outfit in Green, Purple and Coral. Great for a casual Easter, unique and one of a kind. 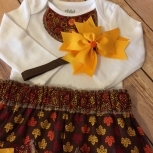 The "Child of Mine" by Carter onsie is adorned with an attached bib, with ribbon trim and cute buttons in purple and green. 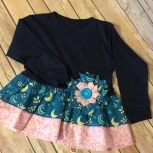 The skirt is made to match the attached bib, with wide elastic for comfort, sweet crescent shaped pockets, with buttons. Floral material with a herb print for contrast. All seams have been serged for a professional look as well as neatness and durability. Easy care with machine wash and dry. Skirt may require light ironing. Item ships from: Cabot, AR, US. In most cases, the expected delivery date reflects 1-3 business days and is based on origin, destination and drop-off time. The expected delivery date does not come with a money back guarantee. Boxes and envelopes are delivered with your regular mail usually within 7 to 10 business days. Buyer must notify me within 3-days of receiving item with an explanation of why they wish to return the item and will be responsible for the shipping cost. If they item is not received within 7 business days then a refund will not be issued.